Officers were attacked by a pit bull and an armed suspect during drug raid. A 58-year-old woman and her husband were shot dead by undercover police during a raid on a suspected Houston drug house that left five officers injured, including two who were shot in the face, officials said Tuesday. "We're very concerned about one," Houston Police Chief Art Acevedo said during a news conference at the hospital. "While he's stable, we just ask for prayers. He's in for a fight." 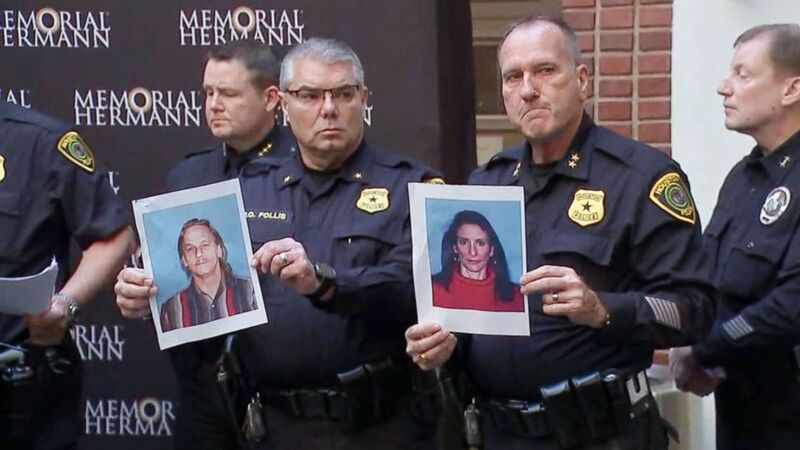 (KTRK) Houston police officers hold the photos of two suspects in the shooting of five police officers during a press conference at a hospital in Houston, Jan. 19, 2019. The suspects were identified as Dennis Tuttle, 59, and Rhogena Nicholas, 58. Tuttle's sister, Elizabeth Ferrari, told reporters Tuesday that Nicholas was married to her brother. 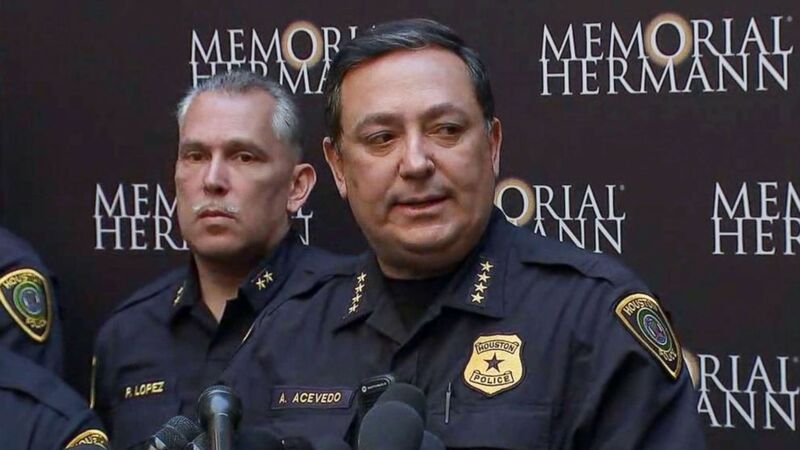 Acevedo did not identify the injured officers but said they are all veterans of the Houston Police Department and range in age from 32 to 54. Four officers suffered gunshot wounds and a fifth officer sustained a serious knee injury that required surgery, according to Acevedo. (KTRK) Houston police Chief Art Acevedo speaks about the shooting of five police officers during a press conference at a hospital in Houston, Jan. 19, 2019. He's a big teddy bear ... The only thing bigger than his body in terms of stature is his courage. I think God had to give him a big body just to be able to contain his courage. 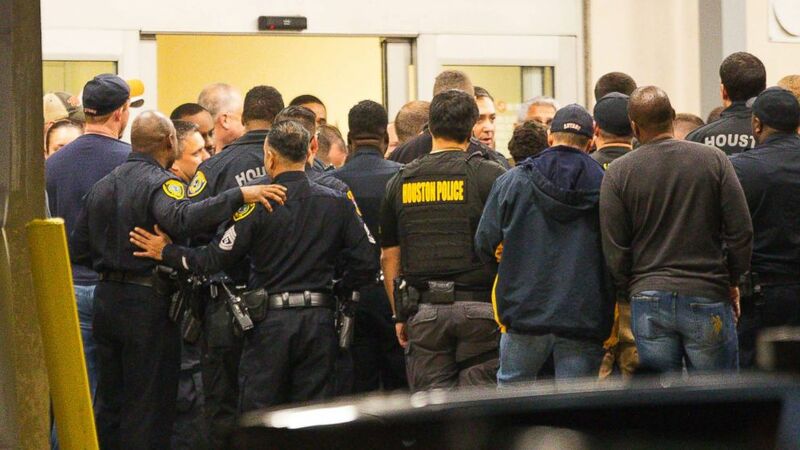 (Mark Mulligan/Houston Chronicle via AP) Officers listen as Houston Police Chief Art Acevedo comes outside of the emergency department at Memorial Hermann Hospital after visiting injured officers in the Texas Medical Center, Jan. 28, 2019, in Houston. "He's a big teddy bear," Acevedo said of the officer. "He's a big African-American, strong as an ox, tough as nails. The only thing bigger than his body in terms of stature is his courage. I think God had to give him a big body just to be able to contain his courage." While visiting the lead investigator at the hospital on Tuesday, Acevedo said, the wounded man passed a note to a colleague that read, "I had to get in there because I knew my officers were down." If you're the ones that are out there spreading the rhetoric that police officers are the enemy, just know we've all got your number now, we're going to be keeping track of all of y'all, and we're going to make sure that we hold you accountable every time you stir the pot on our police officers. (Brett Coomer/Houston Chronicle via AP) Police investigate the scene where several Houston Police officers were shot in Houston on Monday, Jan. 28, 2019. "A lot of drug houses have surveillance systems that are better than businesses," Acevedo said. Ferrari said her brother had served in the U.S. Navy and received an honorable medical discharge years ago. 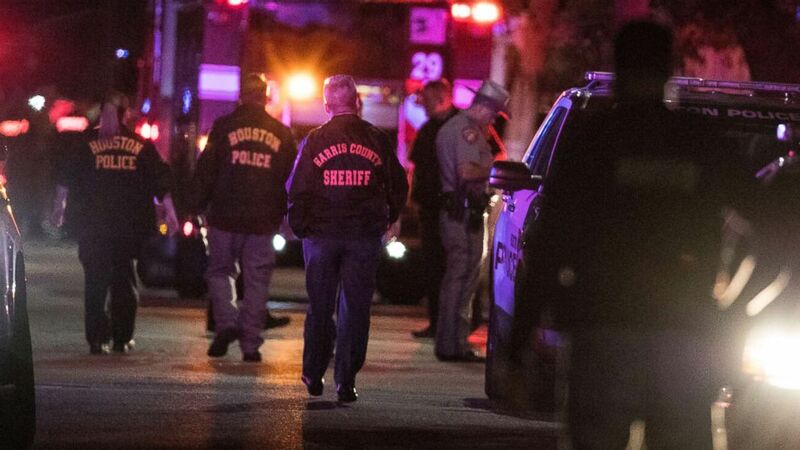 "Our prayers are with the officers and their families who were affected," said Ferrari, who drove to Houston from her home near Dallas as soon as she heard of the deadly police raid on her brother's home. "It's a very tough situation. I do not know any details other than I came here hoping it was incorrect." She said she just spoke to Tuttle last week by phone. "He was just telling me he loved me and he was proud of me," she said. "I just shared with him that I loved him. It was a good conversation." Acevedo said the shooting again proves just how dangerous law enforcement work can be. "We know that we live in a society where there's a proliferation of firearms, where you can assume there will be firearms at just about every location that you hit," Acevedo said. "Unfortunately, some people just don't have respect for the sanctity of life." On Monday evening, the president of the Houston Police Officers Union, Joe Grimaldi, said he was "sick and tired of having targets on our back." "We are sick and tired of having dirtbags trying to take our lives when all we're trying to do is protect this community and protect our families," Gamaldi said during an emotional news conference. They offer a lot of prayers, but we didn't elect people to pray for us. We elect people to lead us. We elect people to make public policy decisions. So to the elected officials, I appreciate your prayers but quite frankly we've got a community that prays for us. “If you're the ones that are out there spreading the rhetoric that police officers are the enemy, just know we've all got your number now, we're going to be keeping track of all of y'all, and we're going to make sure that we hold you accountable every time you stir the pot on our police officers," Gamaldi said. "We’ve had enough, folks. We're out there doing our jobs every day, putting our lives on the line for our families." Acevedo said Tuesday that he understands Gamaldi's frustration. He described gun violence in America as "a public health epidemic" and said it is up to elected officials to finally get serious about tackling the problem. "They offer a lot of prayers, but we didn't elect people to pray for us. We elect people to lead us. We elect people to make public policy decisions," Acevedo said. "So to the elected officials, I appreciate your prayers but quite frankly we've got a community that prays for us."